as a ballet school where adult can take a step forward to start ballet from no experience. but to uplift their daily life quality through ballet. Beautiful legs like ballet dancers or figure skaters come from flexible and trained adductors. You will be able to have such strength and flexibility from taking ballet lessons. Ballet dancers are known for their fabulous posture and graceful presence coming from core strength. Ballet lessons will train your inner muscles and give you beauty for life. AXIS has many students who started, or re-started, ballet from adult and enjoy it. Let us introduce their radiant life. After I graduated school and started working, I felt like I wanted to start something new. So I started ballet. Soon after taking some ballet lessons, my friends told me that “you have nice posture” or “you have slender legs.” I also felt my stiffed shoulder got better. During ballet lessons, I can take my mind off my troubles, so it helps me from removing stress. When I can’t make a lesson, instructors kindly tell me that ‘it’s okay,” so I don’t feel pressure from it. Everyone who comes to AXIS is nice people. Everyone, including fine dancers and experienced dancers, never be mean to beginners, that’s one of the reasons why I have been able to continue. I wish to master more difficult movements step by step and continue ballet for a long time. I used to take ballet when I was a kid, and I wanted to start it again. I saw the website of AXIS and felt the atmosphere is good, so I decided to take lessons here. When I feel that I can change my body little by little even when I became older, I think such feeling really worth everything to me. I became more careful with what I eat and physical condition, thanks to ballet. People in AXIS always give me power, and instructors are kind and willing to teach a lot of things. When we work on recital, I am moved with the process that many people come together and build one work. I love performing, so I am working on my dream to play more solo on stage and entertain audiences with my performance. We are so proud of our experienced instructors. Please don’t hesitate to ask any questions to instructors. Q. My body is inflexible. Is it okay to take ballet? This is actually the most frequently asked question, and the answer is no problem. Many adult started ballet and yoga from no experience with us. Most students become flexible after taking lessons for a few months. Q. Can students rent ballet shoes at studio? We do not have ballet shoes for rent. If you don’t have ballet shoes when taking trial lesson, please wear sox which you would not mind getting dirty. We have 2 types of courses; Regular Course and Ticket Course. You can choose either course that fit your needs. Whether you choose Regular Course or Ticket Course, you can take lessons both at Tamachi Studio and at Kotakemukaihara Studio. Regular Course is a system that we ask for monthly fee for certain number of classes. The monthly fee shall be paid with direct debit, so it won’t bother you to prepare cash. When you take Option Class, it will cost below rate. If you could not come to classes and remained number of classes, the balance is carried forward to the next month (but carry-over shall be applied only up to one month). If you want to take more lessons than you paid for, you can take one class for 2,000 yen. *We ask two months fee by cash for admission. If you choose Ticket Course, you will buy ticket package by cash. You can purchase tickets each time you need it.Recommended for people who are likely to fluctuate schedule and frequencies. Tickets expire in 3 months after beginning of use. If the ticket expires, you can reactivate it for 200yen per class. Premium lesson for those who wish to take personal lecture. After a private lesson, instructor will give you an Advice Sheet made just for you. If you wish to get better with personal advice from instructor, we encourage you to take advantage of the Premium Course. For reservation, please send a request from contact form. When sending a request, please make sure to clarify below items. If you have to cancel with unavoidable reasons, you must notify it by minimum of 3 days prior to the lesson date. We will deduct 800yen for handling charge and refund the remaining fee. If you cancel 1~2 days prior to the lesson date, we CANNOT REFUND the lesson fee. We also offer drop-in classes that do not require registration. You can take TRIAL LESSON if you are the first time taking AXIS’s class. From the second time, you may take lessons as a VISITOR. Please select the class and apply with on-line system (Japanese), or please send a contact form and let us know the class you would like to take. Please contact me in either Japanese or simple English. 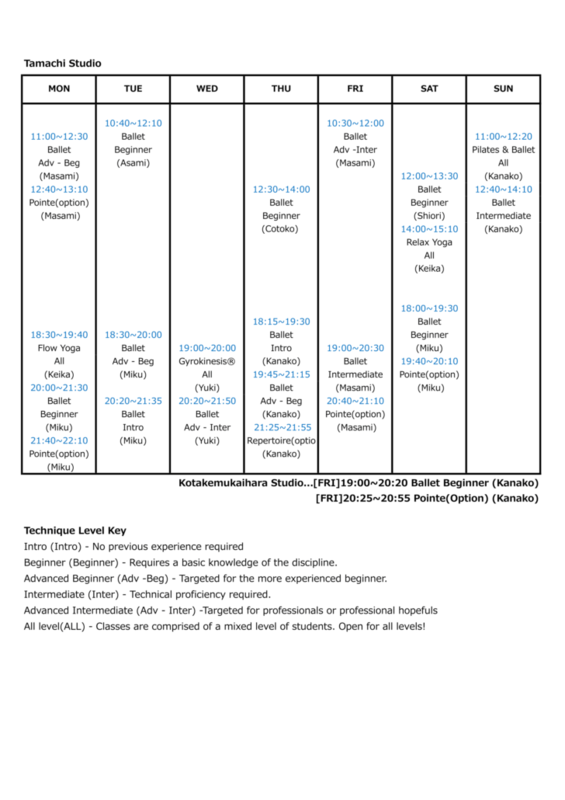 Start fun ballet with no or little previous experience! Refresh and relax in between busy days. Good access ballet studio from JR Tamachi station and Toei Mita station. Instructors from SHIKI and famous ballet companies will kindly teach you. ※Please take the stairway on the leftside of the building up to the second floor. Ballet lesson will be in the B STUDIO. 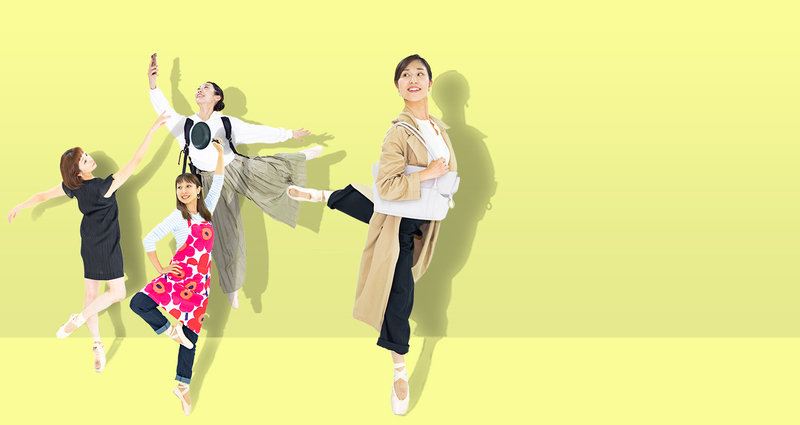 AXIS Junior Ballet school for children from middle school age down to 3 year and 6 month old. Professional instructors will teach correct basics that suit children’s growing bodies. *There are classes for adult too. Click here to find out more about junior school.